I began by researching recipes for sweet stouts and milk stouts. I thought these, combined with the General Mills Count Chocula breakfast cereal, would make a nice combo. The chocolate and sweetness of the stout should mingle with the same flavors in the cereal, but with enough roasty grain flavors to keep it from being a chocolate bar in a glass. The recipe presented here is my own, based on a couple of sweet stout recipes I found. Since the cereal is mostly corn and corn syrup (per the ingredient box), I treated it as flaked corn in the BeerSmith data. This must have been about right, as the original gravity I achieved matched up perfectly with BeerSmith. I included the breakfast cereal and the cacao nibs in the mash. The cacao nibs were crushed and mashed with the grain. The cereal was added whole into the mash after the grain had settled in. I wanted it on top of the grain bed out of concern that it might generate a lot of trub. I figured the grain bed might hold it in rather than letting it fall onto the bottom of the kettle and the heating element. Since the recipe includes oats, it seemed prudent to do a protein rest. Then, I decided to do a Hochkurz Mash after that, to maximize the beta amylase and alpha amylase activity. I hoped this would help convert more of the starches to sugars and that the extended alpha rest would yield a more full-bodied beer. After the sparge, the kettle contained less than the expected 6.6 gallons. I added a half gallon to reach the target volume. I suspect this wort shortfall was due to not counting the cereal in the grain bill. Refractometer readings were 11.4, 12.1, and 13.3 Brix before the boil. This was lower than I expected, but the lactose had not been added. I suspect BeerSmith might have included that in its calculations. It was interesting to note that the breakfast cereal "vanished" during the mash. I could not see a single recognizable piece of cereal or a marshmallow in the grain basket. The wort seemed to have a nice chocolate aroma, with an unexpected hint of cinnamon to it. My guess is that the spice aroma might have come from the hops. 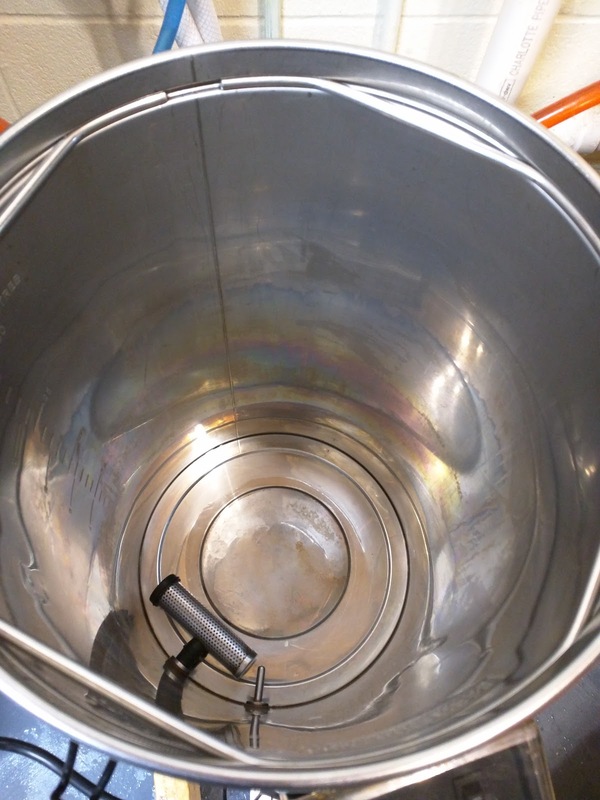 It did take an unusually long time to complete the sparge. This was probably due to the use of the oats and the breakfast cereal without any rice hulls to help with drainage. If I make this (or a similar recipe) in the future, I'll include some rice hulls. 0 minutes: Run cold water through the chiller to cool it down, then pump the wort into the fermenter. Pitched yeast, Clarity Ferm, and sealed it up. 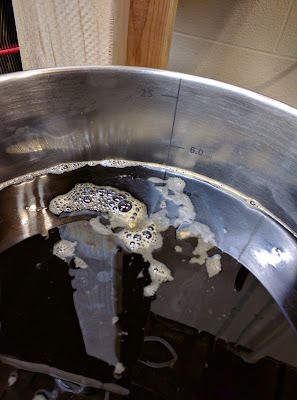 Post boil I found 5.5 gallons in the fermenter with a 15.4 Brix gravity, exactly as calculated. There was a small amount of wort left in the kettle and a fair amount of sediment. Given that the ambient temperature in my basement is currently 69F, I decided to rely on ambient cooling for this one. I also decided not to use a fermentation wrap to keep it warm, as I don't think that will be necessary. My plan is to ferment this one at whatever temperature it reaches during the first week, then transfer it to a secondary fermenter along with some cacao nibs and more breakfast cereal. 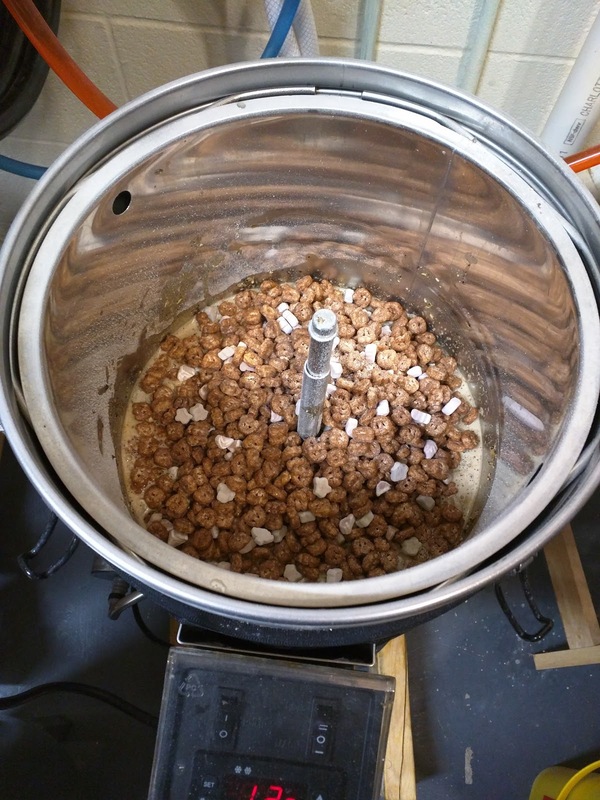 I'm hoping it will pick up the cereal's aroma prior to bottling so that it will be possible for people to detect the cereal in the beer. I'm also planning to prime the beer with Hershey's syrup instead of corn sugar. My goal is for the beer to have as strong a chocolate note to it as the cereal itself. The use of the breakfast cereal was a bit of a wild card in this brew. I did not know how to account for it in the BeerSmith figures, but after seeing that it was mostly made of corn and corn sugar, I decided to treat it as flaked corn in the mash. This seemed to be a decent approach, as I hit the original gravity I calculated in BeerSmith. 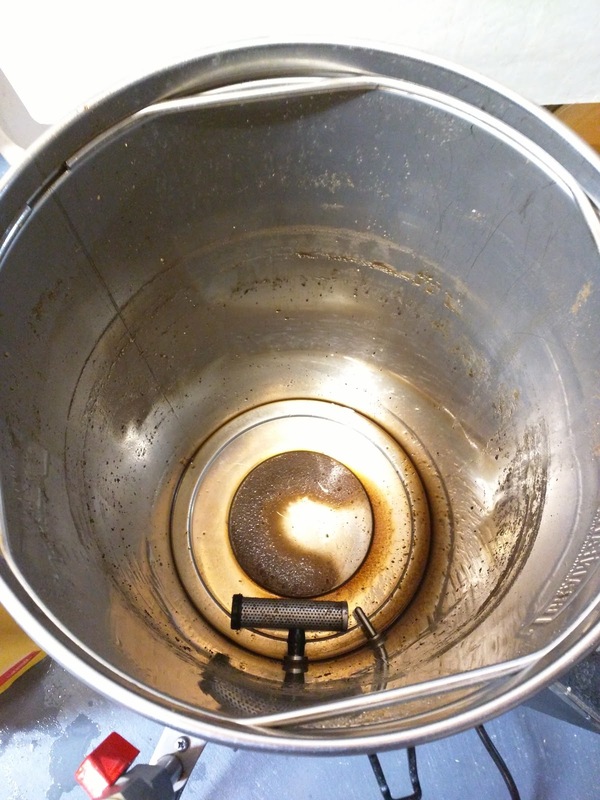 The cereal did not appear to increase the "mess" in the kettle after the boil. I saw more or less the same amount I've seen from other brews that did not include breakfast cereal. What mess was in the kettle after the boil scrubbed off within seconds. For this reason, I wouldn't hesitate to brew other beers with breakfast cereal, though I will see how this one turns out before I do. I've wondered what effect a cereal like Fruit Loops or Fruity Pebbles would have on a cream ale or kolsch style beer. This is all the "mess" the cereal left - not much. Cleanup was no problem. It practically wiped off! Approximately 24 hours after pitching the yeast, the airlock showed slow but steady activity, indicating that the yeast seemed to like its new home. I'll be keeping an eye on it to see how well and how quickly it ferments, but so far so good. Update 05/10/2017: Fermentation appears to have stopped or at least significantly slowed with this one. I haven't seen airlock activity in days and the gravity of samples taken through the valve on the fermenter has not changed, measuring 10 Brix. According to BeerSmith, it's reached an estimated 5% ABV at this point. The samples I have extracted have contained a good bit of sediment, probably from the cereal and cacao nibs, but it's hard to say for sure. I decided to transfer the beer to a secondary fermenter to get it off the yeast and sediment. The empty fermenter had a nice chocolatey aroma before I cleaned it, as does the beer itself. The beer has a nice base stout flavor, with a very mild sweetness, plenty of chocolate flavor, and a subtle aroma of Count Chocula from the cereal added during the end of primary. If it continues to taste and smell this well from the bottle, I'll be quite happy with it. Update 05/22/2017: The beer is now bottled and has gone through about a week of carbonation time in the bottle. A bottle opened over the weekend was only mildly carbonated. A hard pour was necessary to get much of a head on it. The beer has a nice chocolate and malt aroma. The flavor is mildly sweet with definite chocolate notes and just enough hops bitterness to balance it out. It reminds me of a slightly more chocolatey Left Hand Milk Stout.